It all looks so good! I love how the girls looked And the games and activities sound great – I wish I was a kid again to go to a party like that! Well Emma, it certainly makes the kids&#39; parties around this place look very bland indeed. What a wonderful experience for all. Absolutely love all the activities on offer. This is so cool! 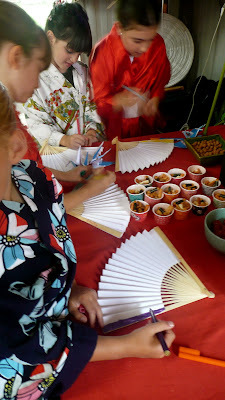 I love the cherry blossom trees and fans- such great ideas.<br />The kids look so cute all dressed up… another awesome party! !